Bikes May Use The Full Lane? In the summer of 2009 the City Of Miami ran a bicycle safety ad campaign on bus shelters throughout the city. The public service ads informed motorists about the "3-Feet Law", that "Bikes May Use Full Lane", and for cyclists to "Always Use Lights At Night". The campaign was welcomed by cyclists who finally felt acknowledged by the local government. However, in recent months a few cyclists have received citations for doing exactly what one of those ads advised, using the full lane. I have obtained a traffic citation which was recently issued in Little Havana for violation of Florida Statute 316.2065 (5), during this particular incident the cyclist was instructed to "move to the right or get on the sidewalk". Really? Using the full lane when allowed is one of the safest practices for cyclists, it prevents too-close in-lane passing and right hook turns. Also, cyclists riding past parallel-parked cars should maintain a clearance of 4 feet to avoid risk of collision with an opening car door. Below is an example of the actual road where the ticket was issued with an illustration of where the cyclist was riding. The cyclist was using the full right lane on a one-way three-lane road with on-street parking and a 30 mph speed limit. Informing cyclists that "Bikes May Use Full Lane" only to have police berate them can be very disconcerting. 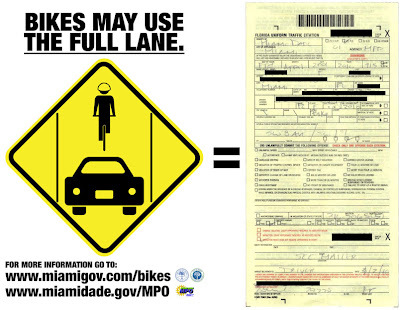 Miami claims it is committed to becoming a Bicycle Friendly City by 2012, yet in 2010 cyclists are receiving citations and advised to ride on the sidewalk and/or gutter. Miami will never be a safe place to ride a bicycle if cyclists continue to be wrongfully punished for riding their bicycles by those who uphold the law. Email Collin Worth at cworth@miamigov.com (305) 416-1022 and ask him what the City of Miami is doing to educate law enforcement, because if they don't understand bicycle laws how can we expect motorists to. Florida Statute 316.2065 Bicycle regulations. 3. When reasonably necessary to avoid any condition, including, but not limited to, a fixed or moving object, parked or moving vehicle, bicycle, pedestrian, animal, surface hazard, or substandard-width lane, that makes it unsafe to continue along the right-hand curb or edge. For the purposes of this subsection, a "substandard-width lane" is a lane that is too narrow for a bicycle and another vehicle to travel safely side by side within the lane. The best way to improve bicycle safety is to get the police to enforce the existing traffic laws. Unfortunately they do not even know the law. The fact he had to write a law down to say you for violated it when it clearly gives you the right doesn't make any sense. That's like giving you a ticket for going 30 mph in a 30 mph zone. Did you both read the law there? Then again, maybe he knew that it didn't matter if he was right or not. If I can recall correctly (or not), you have to show up to court to defend your case and still pay court costs? For him, it doesn't matter if he shows up or not. You still have to. Maybe he was aware of this when he wrote the ticket, it was his form of harassment. Regardless, that's an incovenient situation. Thanks for posting this, Rydel. I'll just print this in color and take it to court with me. You should be an attorney! It would be interesting to know how fast the cyclist was traveling [probably <30, right?] and how long they were using the full lane. If the cyclist had been traveling to the right as the law dictates and had drawn a ticket merely by moving to the left to allow room for the car, the citation is clearly bogus. But if the cyclist had been traveling using the full lane without there being one of the exceptions present, then I can understand why the citation was issued, especially if they were under the posted limit. Motorists violating the 3 feet law are far more dangerous and easier to prove with a simple photograph. It usually happens once per mile when I'm bicycling in Miami. How many tickets have been written for those violations? Last time I reported being struck by a car the MPD officer didn't know anything about that part of the law. Rick, have you ever bothered to read the statutes? VC'ing is legal on any lane narrower then 14 feet in width. Maybe you don't care for this, but it IS undeniably the law as written in the statutes. Before you state "facts," make sure they are correct. Sorry, Kurt. I read the statute that MBS posted and provided an opinion. That's all. Maybe I don't have all the facts, but you have one crappy attitude. As a visitor I was stopped by a LEO who told me I had to get off the road with cars behind me. We had a long conversation about the "law". One thing that helps is to keep a friendly attitude with your LEO while "ejukating" them about the law. At the Snowbird Century I received a nice bicycling handbook that I keep with me. This ticket should be dismissed. FL bike advocates need to get that FTR law repealed. There's an article arguing this point at CommuteOrlando. I just amazes me that people think it's safe for a car and a bike to be in the same lane at the same time. One going 30-50 and the other going 10 when the rider might be 10 years old. The ones that think it might be a little unsafe try and pass a mandatory helmet law to protect the rider. Give me a freekin break. Rod, I have many decades of experience that leave no doubt that "...it's safe for a car and a bike to be in the same lane at the same time. One going 30-50 and the other going 10..."
Does it occur to you that if there is no physical contact between the traveler "...going 10 when the rider might be 10 years old. ", then it doesn't matter if the other is going "30-50" or "300-500"? On most public roads in South Florida, there is sufficient room for the average motorist to pass the average cyclist safely, if the cyclist obeys the requirement to keep as far to the right as practical and both are prudently focused on what they are doing. As far as the helmet nonsense is concerned, you'll get a mandatory helmet law passed over my dead body. Even motorcyclists are allowed, as they should, to decide the matter for themselves. As for cyclists, some should wear helmets and others should not. But each individual must make the decision for themselves. 3 feet is not enough. Just like a 30 mph limit becomes 45 a 3 feet law becomes 3 inches. I'm a convert of the take the lane. I did believe that cars could share the lane but had way too many close calls. I now take the lane and I feel a great deal safer. On a 2-lane road I do the old share thing and grimace every time cars come closer than 6 feet. On a 4 lane un-crowded road I make the cars change lanes and pass. Try it you might like it...Mikey likes it. I have been told that the police commander of the Little Havana area has spoken to his officers and made sure they are aware of the statutes. He has specifically made sure that no one has cyclists as a target. He said cyclists may get pulled over for various reasons, but taking the full lane should not be one of them. 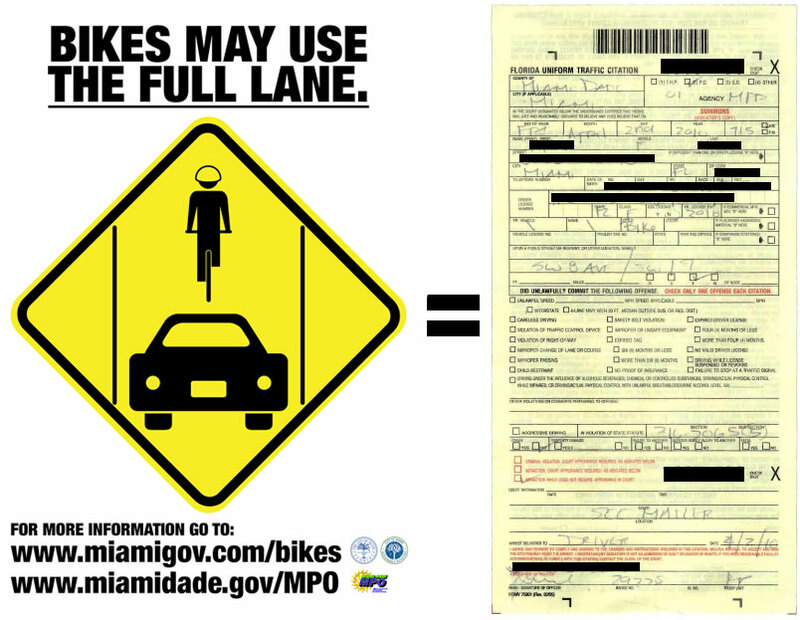 Thanks to everyone who emailed The City of Miami Bicycle Coordinator.